Apparently the Forensic Files episodes on Netflix aren’t the whole series, just a collection of episodes from various seasons. So these numbers have no actual basis in anything but Netflix itself. Oh well — I’m enjoying it, nonetheless. With the Unpleasant Medical Procedure, it was not a good week for running, alas, but I at least got some exercise in and didn’t stay idle. 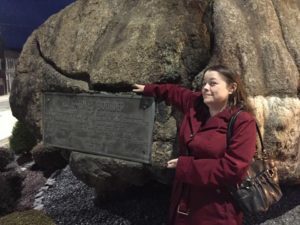 Lise presents: a rock so beloved the town of Fitchburg blew it up, glued it back together, and stuck it in the middle of a traffic circle.